Here's an interesting fact about me: I am thirty years old and have only been to three weddings since graduating college. Which I feel is a fairly low number for my age? Sure, there were a couple that I missed, but in general, my friends aren't the marrying kind (nor are Erlend and I apparently, since we've been together for eight years and don't really have any plans to get married anytime soon). Or maybe I just don't have that many friends, lol. OH WELL. Although 2018 might be the year that the tide is changing; I've got a couple of weddings that I'm attending this year that I'm pretty excited about, especially since I am serving as a cake consultant/maker for some of them. One of my friends is doing a very low key wedding and has asked me to make an equally low key cake for the occasion. "I'll even take one of your leftover blog or book test cakes," she said, waving me off when I asked what kind of wedding cake she wanted. "Whatever you make, I'm sure I'll be happy with." Usually I'd be suspicious of the bride's very nonchalant vibe, but I sincerely believe that my friend actually has no dog in the wedding industrial complex fight since she's getting married barefoot on a campground with a taco truck and BYOB. But still. It seems like it merits a special cake, right? So I've been practicing different wedding cake decorating techniques and texting her all the while furtively monitoring her opinion with each one. 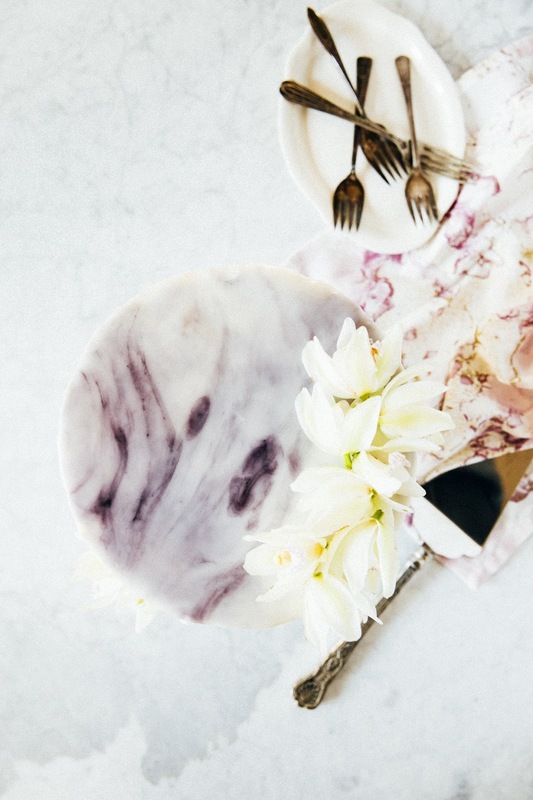 So far it's a no on the naked cake look, but a very enthusiastic two-thumbs up on the carrara marble look. Carrara marble glaze is easy to do on cookies, but honestly, was a trickier challenge on this cake. I ended up pouring the glaze on the top of the cake (similar to the technique seen on this Instagram video); unfortunately, while the glaze worked well for the top of the cake, it was a bit too thin to really hold its pattern as it dripped down the side of the cake. But I'm sharing it anyway because the cake itself is pretty delicious. The cake is a leftover recipe from when I was testing a bunch of white cake recipes from Weeknight Baking and is adapted from the white velvet cake recipe by old-school baking queen, Rose Levy Berenbaum. 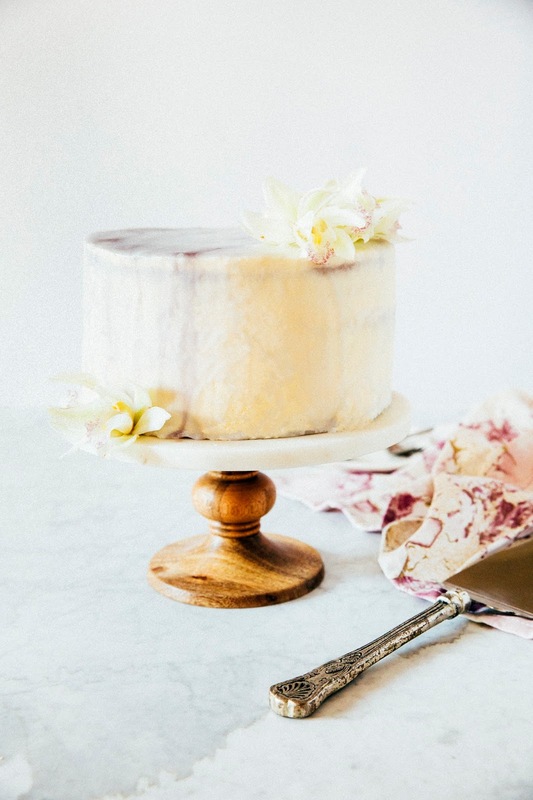 Each cake layer sandwiches a healthy proportion of dulce de leche and is completely covered in Swiss meringue buttercream and the carrara marble glaze. Enjoy! Dulce de leche is available in most Latin American supermarkets or online (I'm partial to the Stonewall Kitchen or La Lechera variety; in a pinch, you can make it yourself at home with a slow cooker or an instant pot! I've got instructions for how to do so in this recipe for dulce de leche brownies. 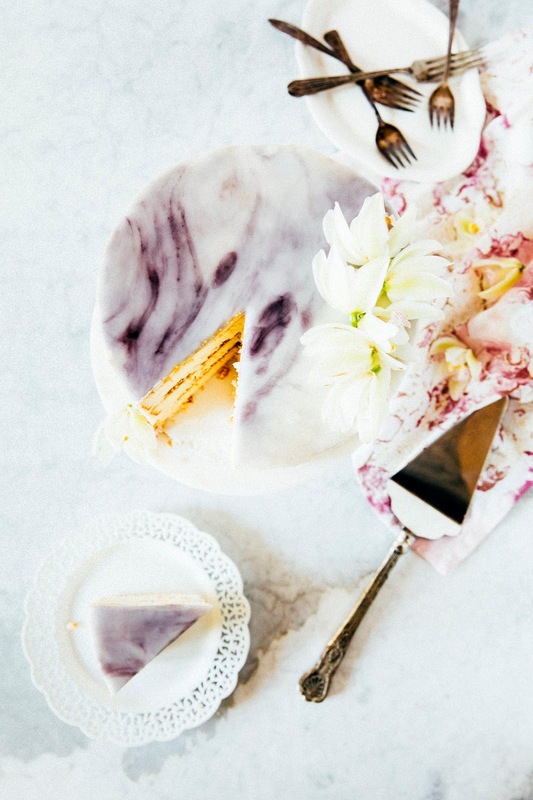 In a pinch, you can probably get away with not glazing the cake with the carrara marble glaze. Unless you're really going for the look, the glaze doesn't actually add that much flavor. I think the reason why my glaze isn't quite pronounced is that you actually need a LOT of the glaze in order to make it visible. I've double the original recipe quantity for your use — hopefully that'll do the trick! It's also a lot easier to glaze the cake if the cake has been chilled for at least an hour or so in the fridge; the glaze doesn't tend to adhere as well to the cake if the frosting is at room temp. I recommend even sticking it in the freezer for at least 10 minutes before glazing. In the bowl of a freestanding electric mixer fitted with a paddle attachment, combine 3 cups cake flour, 1 1/2 cups granulated sugar, 4 teaspoons baking powder, and 1/4 teaspoon kosher salt. Beat on low speed until combined. With the mixer on its lowest setting, add 3/4 cup butter, one cube at a time, continuing to mix until the mixture has the texture of cornmeal. Add 1/2 cup of the whole milk all at once, and raise the mixer speed to medium and beat for 2 minutes or until the batter is light and fluffy. While the batter is mixing, whisk together 4 large egg whites, 2 1/4 teaspoons vanilla extract, and remaining 1/2 cup of whole milk in a large liquid measuring cup or a medium bowl with a spout. Reduce the mixer speed back down to its lowest setting and add the egg white/vanilla/milk mixture in 2 to 3 additions, scraping down the sides of the bowl well after each addition and beating only until combined. Divide the batter evenly between the three prepared cake pans. Transfer to the preheated oven and bake for 35 minutes, or until a skewer inserted into the center of the cake comes out clean with few crumbs and the top of the cake bounces back when gently poked. Transfer to a wire rack and cool completely before frosting. To assemble cake, spread about 1/2 cup dulce de leche on top of the bottom layer and middle layer before covering completely with Swiss meringue buttercream. Reduce the mixer speed back to its slowest setting and add 2 teaspoons pure vanilla extract. Use buttercream right away; even though the buttercream will look like it's too soft, it's actually a dream to pipe with. Unless it's a super hot day (above 85-90 (F)), there's no need to refrigerate it for it to stiffen — doing so will just make it harder to work with. When the cake has been frosted and chilled (see baker's notes), it's time to glaze it. In a double boiler (or, a homemade one with a heatproof bowl set on top of a saucepan with an inch or two of water — the bowl shouldn't touch the water!) over medium heat, combine 4 cups confectioner's sugar, 1/4 cup light corn syrup, 6 tablespoons water, and 1 teaspoon pure vanilla extract. Whisk to combine and continue stirring occasionally until the mixture is smooth and homogenous. The icing should be fluid but not so warm that it will melt the frosting; the ideal final temperature of the mixture should be below 100 (F). Remove from heat and transfer the bowl to a wire rack to cool slightly. 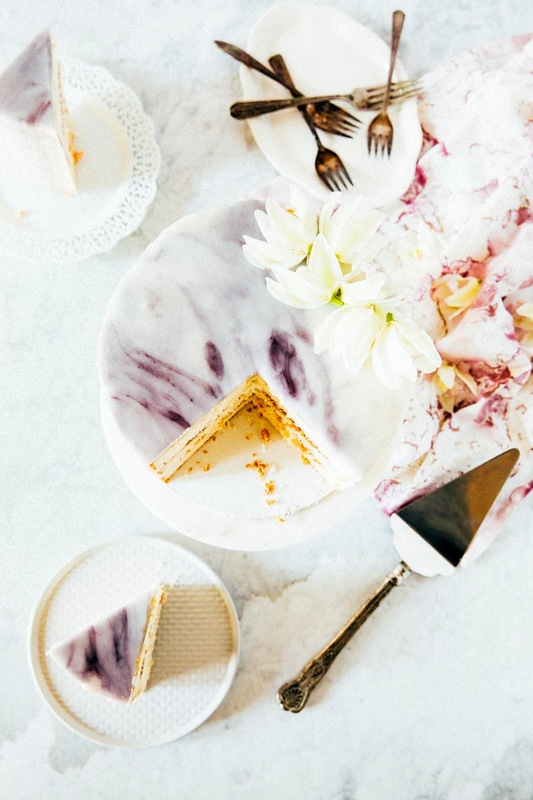 Transfer the cake to a wire rack on a sheet pan — this will help catch any glaze drippings and prevent any messes on your counter. Return to your slightly cooled glaze and gently stir 1 to 2 drops of gray food coloring into the mixture. When I mean stir, I mean "half-heartedly stir" — the mixture should still be predominantly white at this point, but streaked with gray food coloring. This works best if the glaze has cooled — if the glaze is too hot, the food coloring will melt and incorporate throughout the mixture. You want it to be streaky! Working quickly, pour the glaze on top of the center of the cake. 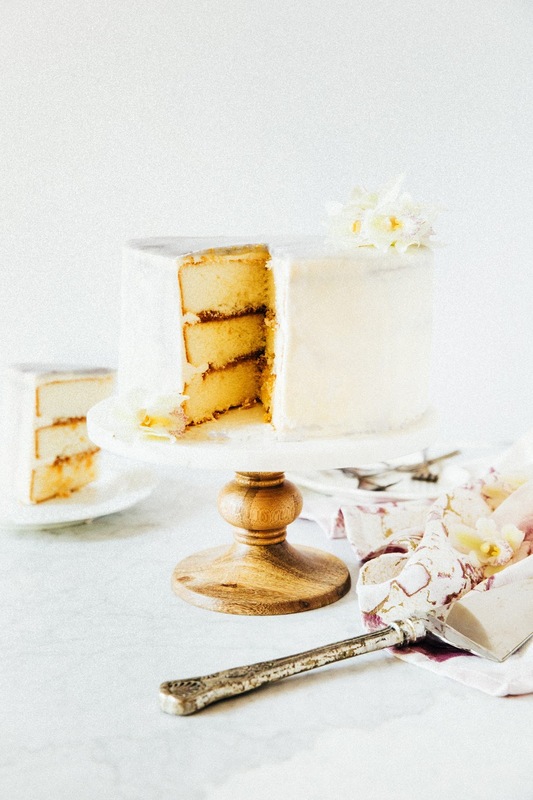 Let any excess drip off and dry for 3 to 4 hours before transferring to a cake stand and serving.